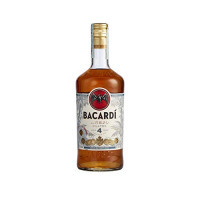 "70cl / 40.0% - Bacardi is best known for its white rum, but it does do some excellent aged products. This 4 year old is a brand new addition to the line-up and sits between the Carta Oro rum, which is primarily for mixing, and the 8 Year Old, which is more of a sipper. The result is effortlessly smooth, honeyed and spicy."